(Released 9 April 2002) This THEMIS image captures two channels (Nirgal Vallis is the smaller sinuous channel on the left and Uzboi Vallis is the larger channel located in the lower right) and Luki Crater located in the upper right. The mouth of Nirgal Vallis appears to be truncated by Uzboi Vallis. 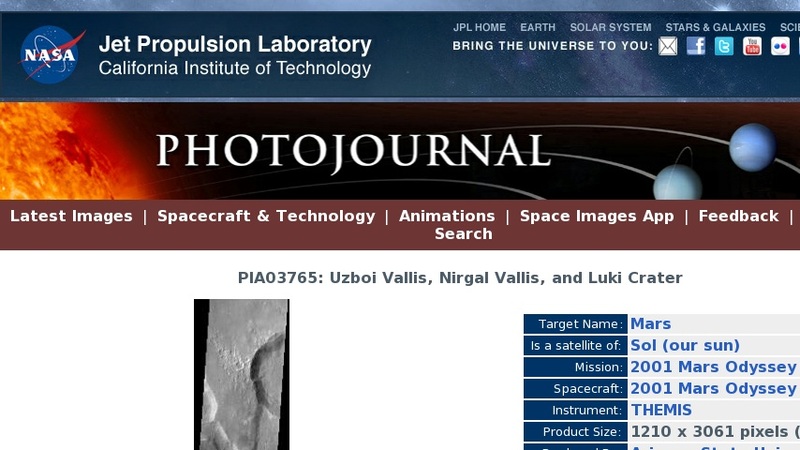 This indicates that Nirgal Vallis is an older channel than Uzboi Vallis. The floor of Uzboi Vallis was subsequently bombarded by an asteroid or comet which gouged out the 21 km diameter crater named Luki. Luki is named after a town in the Ukraine. Uzboi is the name of a dry river in Russia. Nirgal is the Babylonian name for Mars. Gullies and alluvial deposits discovered by Mars Global Surveyor are clearly visible on the polar-facing (south) wall and floor of Nirgal Vallis and also in the inner rim of Luki crater. These gullies appear to emanate from a specific layer in the walls. There is a pronounced sparsity of gullies on the equator-ward facing slopes but some are present in this image. The gullies have been proposed to have formed by the subsurface release of water. The western channel wall of Uzboi Vallis does not appear to have the fine-scale gullying as does Nirgal Vallis. However, the western channel wall of Uzboi Vallis does show some evidence of downslope movement (mass wasting). Some patches of dunes are also seen on the channel floor, notably along the edges of the channel floor near the canyon walls. There is also a landslide located along the southern wall of Luki Crater.